The hour is very early, around 1:45 a.m. on Ember Wednesday in Advent, December 19, 2012. I was busy working yesterday on my other project as I have been told by a professional web developer that I must "create traffic" by adding what are called "back links" in order to generate "hits" for Meeting the Mets: A Quirky History of a Quirky Team. Thus it is that I spent a bit of time writing a post about a recent development in the world of baseball, a post that winds up, of course, with an commentary about the insanity of paying men millions upon millions of dollars to play games. Yes, the book is Catholic from beginning to end. Although there is a great deal of good baseball, complemented by a lot of quirky facts and amusing diversions, I know that the mainstream media will continue to pitch a "shut out" against the book even though a local sports radio show host in the Cincinnati, Ohio, area, enjoyed it thoroughly. You can help spread the word if you would be so kind as to do so. Thanks. Anyhow, even though I wrote on my home page about twenty-four hours ago now that I did not think that there was any need to rework material that I had written in "Blessed" Paul The Sick sixty-four days ago now, it occurred to me that a few observations are in order prior to reviewing yet again the "heroic virtues" that distinguished the priestly and episcopal career of Giovanni Montini/Paul VI. The first observation, and I promise that this will be brief, involves the rapid decomposition of the body of the second conciliar "pontiff" that I discussed in passing sixty-four days ago now. The following thought occurred to me when corresponding with a Catholic writer about the rapid decomposition of Paul VI after his death. The dead body of Paul the Sick, who died on the Feast of the Transfiguration, was, if you think about it, the antithesis of the Transfigured Body of Our Lord on Mount Thabor. Our Lord's Body was glorified in the presence of Saint Peter and the sons of Zebedee, Saints John and James, with the glory that He had with the Father in Heaven from all eternity and that which He manifested after His Resurrection from the dead on Easter Sunday. The body of the false "pontiff," a man who was doctrinally, philosophically, liturgically and morally corrupt, decomposed quickly all on its own. The best that could be done with the body after the formaldehyde was pumped into it was to turn it into that greenish tint. Yes, the man whom the late Father Vincent Bowes, O.C.D., said that Our Blessed Lord and Saviour Jesus Christ had told him was both an Antipope and an Antichrist (see Bookended From Birth to Birth), had his quickly decomposed body testify in death that he was the antithesis of the Transfigured Body of Christ the King, Whose Social Kingship over men and their nations he completely rejected. "Those great patrons of the arts, the Renaissance popes, usually commissioned the artist in their employ - Raphael, Titian, Velazquez - to paint their portraits. The result was some of the greatest paintings ever produced. "Since then the practice has fallen off (along with the art of portraiture). So it was with some surprise that the world learned last fall that a portrait had been painted of Pope Paul VI, even though he did not commission it or, for that matter, sit for it. 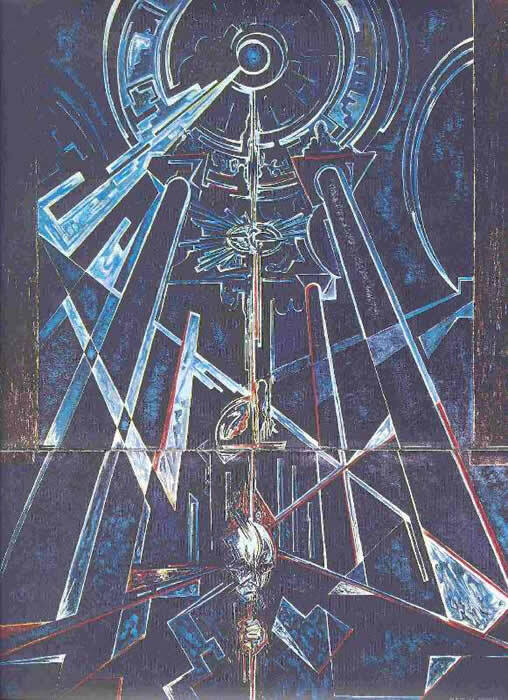 Moreover, it was in a semiabstract style unlike that of any previous papal portrait. "The artist was a 42-year-old German named Ernst Gunter Hansing. Pope Paul did not at first respond to having his picture painted with any enthusiasm, but he later relented. Hansing was given a small studio in the building that houses the Vatican gas station, and for the next two and a half years, during 13 separate visits to Rome, he observed his subject from the front row at papal audiences. "The finished portrait has been accepted by the Pope. His Holiness described the painting as "a mirror of the situation in the Church today." Earlier, on seeing a working sketch, he made what was probably his closest approach to art criticism. It was gracefully oblique: "One almost needs a new philosophy to grasp the meaning of this in its context." Oblique? Giovanni Montini/Paul VI? The man who "suspended" Archbishop Marcel Lefebvre and nearly slapped him in the face could not call garbage by its proper name. To do so would have been to hurt the feelings of the Lutheran artist an thus to damage the cause of false ecumenism. As the conciliar priest who coined the term Paul the Sick noted to me when we stood in front of Montini's tomb in the crypt of Saint Peter's Basilica in October 1984, "Everything about this man had to be modern. His doctrine. His philosophy. His taste in art and music and architecture. His liturgy. Yes, right down to this hideous tomb itself. Everything." Christmas Day is but six days away! The conciliarists will be put to flight soon enough. Our Lady's Immaculate Heart will triumph in the end. Heroic Virtues of Giovanni Montini/Paul VI? Betraying priests behind the Iron Curtain to agents of Josef Stalin (see We Must Accept What Rationalists Reject)? Adopting the methods of Saul Alinsky after meeting him courtesy of Jacques Maritain (see Alinsky's Sheen)? Signing the documents of the "Second" Vatican Council that have resulted in the loss of so many souls to the Catholic Faith and helped to give a textual foundation for the conciliar revolution? Telling the delegates at the United Masonic Nations Organization on October 4, 1965, that "The peoples of the earth turn to the United Nations as the last hope of concord and peace" (Giovanni Montini/Paul VI's Address to the United Nations, October 4, 1965? Constantly extolling the "Cult of Man"? Returning to Turkey the flag of the Turkish flagship that was captured in the Battle of Lepanto? Promulgating false rites of episcopal consecration, priestly ordination, the administration of the Sacrament of Confirmation and abolishing the Sacrament of Extreme Unction? Promulgating the Protestant and Masonic Novus Ordo service on April 3, 1969? Issuing the socialist manifesto Populorum Progressio, March 25, 1967 (see Making a Mockery of Catholicism). Genuflecting before Greek Orthodox patriarch Athenagoras I on December 7, 1965, in Constantinople, Turkey? Permitting First Communion to be given two years prior to the reception of First Penance on an "experimental" basis? Betraying Josef Cardinal Midzsenty (see We Must Accept What Rationalists Reject) while engaging in his wretched policy of Ostpolitik? Redefining the ends of marriage and promoting a "natural" means to limit the size of families in Humanae Vitae, July 25, 1968 (see Forty-Three Years After Humanae Vitae)? Creating one revolutionary bishop (true ones between 1965 and 1968 and false ones in the Roman Rite between 1968 and 1978) after another, including the likes of Joseph Bernardin, Terence Cooke, Bernard Law, Humberto Medeiros, Francis Mugavero, John Raymond McGann, Thomas Gumbleton, Rembert Weakland, Howard Hubbard, John May, Raymond Hunthausen, John Roach, John Quinn and a chap by the name of Joseph Ratzinger, to name just handful as it is 2:00 a.m. on the morning of Tuesday, October 16, 2012, the Feast of Saint Hedwig, after all. Opening the way to the conciliar annulment factory? Presiding over what he himself called "the auto-destruction of the Church" as thousands of priests and religious sisters quit their religious vow and the pews of formerly Catholic churches emptied? Engaging in egregious acts of sacrilege and blasphemy in "inter-religious" events? Promoting "liberation theology" in the name of a "preferential option for the poor" at the Conference of Latin American Episcopates in Medellin, Colombia, on August 246, 1968? Living a life of sin that had been used against him by the Soviets and was later used as a wedge for the Freemasons to get him to approve of cremation? [Atila[ Guimarães quotes Franco Bellegrandi, a former member of the Vatican Noble Guard, part of the papal military corps, who witnessed the unfortunate changes that occurred at the Vatican after Pope Paul VI took office. Bellegrandi repeats the charge that while Archbishop of Milan, Montini, dressed in civilian clothes, was picked up by the local police on one of the archbishop's nocturnal visits to the male brothels of the city. The former Vatican guard describes the homosexual colonization process that he says began under Pope John XXIII, but which accelerated under Montini's rule--a process with [which] the reader should by now be thoroughly familiar. Bellegrandi says that old employees were turned out of their jobs at the Vatican to make room for Montini's favored brethren afflicted with the same vice. They in turn brought along their favorite catamites--"effeminate young men wearing elegant uniforms and make-up on their faces to dissimulate their beards," says Bellegrandi. Bellegrandi says that he was told by an official of the Vatican security service that Montini's actor friend was permitted free access to the pontifical apartments and was seen taking the elevator late at night. An elderly gentleman from Paris who worked as an official interpreter for high-level clerics at the Vatican in the early 1950s told this writer that the Soviets blackmailed Montini into revealing the names of priests whom the Vatican had clandestinely sent behind the Iron Curtain to minister to Catholics in the Soviet Union during the Cold War. The Soviet secret police were on hand as soon as the priests crossed over the Russian border and the priest infiltrators were either shot or sent to the gulag. The extent to which Pope Paul VI was subject to blackmail by the enemies of the Church will probably never be known. It may be that, in so far as the Communists and the Socialists were concerned, blackmail was entirely unnecessary given Montini's cradle to grave fascination and affinity for the Left. On the other hand, the Italian Freemasons, M16, the OSS and later the CIA and the Mafia were likely to have used blackmail and extortion against Montini beginning early in his career as a junior diplomat, then as Archbishop of Milan and finally as Pope Paul VI. There can be no question that Pope Paul VI's homosexuality was instrumental in the paradigm shift that saw the rise of the Homosexual Collective in the Catholic Church in the United States, at the Vatican and around the world in the mid-20th century. Pope Paul VI played a decisive role in the selection and advancement of many homosexual members of the American hierarchy, including Joseph Cardinal Bernardin, Terence Cardinal Cooke, John Cardinal Wright and Archbishop Rembert Weakland and Bishops George H. Guilfoyle, Francis Mugavero, Joseph Hart, Joseph Ferrario, James Rausch and their heirs. The knowledge that a homosexual sat in the Chair of Peter--knowledge that spread like wild-fire on the "gay" gossip circuit--would certainly have served as an inducement for homosexual men to aspire to the priesthood and even prompt them to contemplate the unthinkable--a religious order or community composed exclusively of sodomites. Most important, the long-guarded quasi-secret of Paul VI's homosexual life has, for decades, contributed to the silence and cover-up by the American hierarchy on the issue of homosexuality in general and the criminal activities of pederast priests in particular. But it is a secret no longer. The final piece of the puzzle has been put in place. Yes, sounds like a perfect candidate for "beatification" in the counterfeit church of conciliarism if the assembled non-cardinals give their approval to the "miracle" that took sixteen years to manifest itself and is based upon the diagnosis of a condition in an unborn child by doctors ever eager to convince women to kill their babies by claiming the existence of "problems" that simply do not exist. What could be better? A phony "pope" who lived a life of moral degradation with a phony "miracle" to speed him along the path fo a "beatification" even though his embalmed body turned black before it had been shown to the public and was said to reek of a horrible smell (something that was blamed on the heat of the Mediterranean sun beating down on the poor man's mortal remains)? Sure, "Blessed" Paul the Sick will fit right in with Jose Maria Escriva Balaguer y Albas and Mother Teresa, a syncretist, and Antonio Rosmini, forty of whose propositions were condemned by Pope Leo XIII in 1887 only to be "rehabilitated" in 2001 by Joseph "Cardinal" Ratzinger (see Beatifying Their Own), and most notoriously, Karol Wojtyla/John Paul II (see "Beatifying" Yet Another Conciliar Revolutionary, "Canonizing" A Man Who Protected Moral Derelicts, Unimaginable Deceit and Duplicity, Not The Work of God, To Be Loved by the Jews, Perhaps Judas Was the First to Sing "A Kiss is Just a Kiss", Enjoy the Party, George, Enjoy the Party, and Anticlimactic "Beatification" for an Antipope). What's next? Well, after Albino Luciani/John Paul I gets himself approved for "beatification," the only thing to do after this is to await the death of Joseph Ratzinger/Benedict XVI so that his own "cause" for "canonization" could be introduced by his own successor. That way, you see, each of the five conciliar "popes" would carry with them a "seal of sanctity" with which conciliar apologists could bludgeon critics by saying irrationally, "These men were saints, not heretics and blasphemers as you keep insisting." That's why this is being done. Make no mistake about this whatsoever. Mind you, I have just provided a summary of some of the more salient low lights that qualify Giovanni Montini to be "beatified" as "Blessed" Paul the Sick. For a more extensive analysis, including some of the correspondence that the late Abbe de Nantes, Georges de Nantes, who denounced the "Second" Vatican Council as soon as it was over in 1965 (see The Abbé de Nantes: Fidei Defensor), had with Montini/Paul VI, please see Paul VI Beatified?, by Father Luigi Villa. Montini: "Why do yo not accept the Council? You signed the decrees." Lefebvre: "There were two that I did not sign." Montini: "Yes, two, religious liberty and Gaudium et Spes." Montini: "And why not religious liberty?" Lefebvre: "It contains passages that are word for word contrary to what was taught by Gregory XVI and Pius IX." Montini: "Let's leave that aside! We are not here to discuss theology." Hedwige was illustrious for her royal descent, but still more for the innocence of her life. She was maternal aunt to St. Elizabeth, the daughter of the king of Hungary; and her parents were Berthold and Agnes, Marquis and Marchioness of Moravia. From childhood she was remarkable for her self-control, for at that tender age she refrained from all childish sports. At the age of twelve, her parents gave her in marriage to Henry, duke of Poland. She was a faithful and holy wife and mother, and brought up her children in the fear of God. In order the more freely to attend to God, she persuaded her husband to make with her a mutual vow of continency. After his death, she was inspired by God, whose guidance she had earnestly implored, to take the Cistercian habit; which she did with great devotion in the monastery of Trebnitz. Here she gave herself up to divine contemplation, spending the whole time from sun-rise till noon in assisting at the holy Sacrifice. The old enemy of mankind she utterly despised. She would neither speak of worldly affairs, nor hear them spoken of, unless the affected the interests of God for the salvation of souls. All her actions were governed by prudence, and it was impossible to find in them anything excessive or disorderly. She was full of gentleness and affability towards all. She triumphed completely over flesh by afflicting it with fasting, watching, and rough garments. She was adorned moreover with the noblest Christian virtues; she was exceedingly prudent in giving counsel; pure and tranquil in mind; so as to be a model of religious perfection. Yet she ever strove to place herself below all the nuns; eagerly choosing the lowest offices in the house. She would serve the poor, on her knees, and wash and kiss the feet of lepers, so far overcoming herself as not be repulsed by their loathsome ulcers. The once thoroughly Catholic land of Poland (in which most of Silesia is located) is now littered with men claiming to be "bishops" who have, following the example of Paul the Sick, renounced the Social Reign of Christ the King, good conciliarists that they are, of course (see Distracting Us With More Side Shows, part three from 2010). Our own country is littered with men claiming to be "bishops" who have never accepted the Social Reign of Christ the King, men whose belief that the insidious "market place of ideas" would help everyone, including men such as Barack Hussein Obama, to find "common ground" has made possible the legal institutionalization of various evils that they are now powerless to resist. None of this can come from the Catholic Church. Not one little bit of it. It came from the likes of Paul the Sick and his "successors," including the future "beatus," Joseph Ratzinger/Benedict XVI if God does not intervene by then. Yes, a world where Our Blessed Lord and Saviour Jesus Christ does not reign as King and where His Most Blessed Mother is not honored as its Immaculate Queen is one where most every man will live and think and act and speak naturalistically, not supernaturally according to the Mind of the Divine Redeemer as He has discharged It exclusively in the Catholic Church. The Faith must be shunted aside in favor or the pursuit of wealth or popularity or career success or in favor of this or than naturalistic"system" of economic, social and political "order" to which which must be rendered an assent of faith and a due submission of will at all times. And while there were other forces that have been at work in the world for nearly seven centuries that are certainly responsible for this situation, it is also true that the "reconciliation" by the likes of Angelo Roncalli/John XXIII and Montini and Luciani and Wojtyla and Ratzinger with the false principles of Modernity have made it possible for the last "bastions" of Catholicism against the world to be torn down. Only one who is willfully blind can ignore this truth. We must grow in love more and more with God as He has revealed Himself through His true Church. We will come to hate our sins the more. We will seek to do voluntary penances for our sins and those of the whole world. We will be more attentive to the needs of the members of the Church Suffering in Purgatory. We will have more apostolic zeal for the salvation of souls, seeking to distribute Green Scapulars to those whom God's Holy Providence places in our paths each day. We will live for the Faith, not for the passing things of this world. We must be champions of Christ the King as His consecrated slaves through the Sorrowful and Immaculate Heart of Mary, never fearing the onslaughts of the figures of Antichrist that walk amongst us as long as we pray the Holy Rosary every day as well as to wear and to fulfill the conditions associated with the Brown Scapular of Our Lady of Mount Carmel, making sure to make reparation for our own sins which are so responsible for worsening the state of the world and the state of the Church Militant in this time of apostasy and betrayal. 9. A dagger is thrust in the papal tiara in the 30th Knight Kadosh Degree; here the pope clutches a dagger with a malevolent look.